SANTIAGO, Chile, March 1, 2010 (ENS) – “We are up against an emergency without comparison in the history of Chile and in which fast and urgent answers are needed,” said Chilean President Michelle Bachelet of the 8.8 magnitude earthquake that struck the coast of central Chile Saturday morning. Aftershocks in the range of 4.0 to 5.5 magnitude continue to shake the region. The quake has killed at least 708 people and displaced hundreds of thousands, causing widespread damage to homes, hospitals, schools, roads, bridges and commercial buildings. Some two million people have been affected by the quake, according to government data. Chile’s main international airport in Santiago was shut down, but it is operational again today. 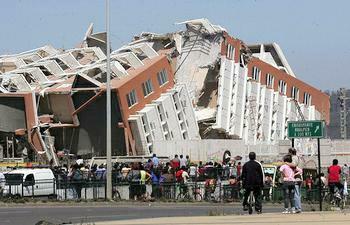 The passenger terminal was damaged in the earthquake, although it was centered 200 miles (320 km) to the south. Runways and systems controls at the Arturo Merino Benitez airport’s were not damaged, allowing military flights and some international commercial flights to land. About 160 flights have accessed the airport in the past 24 hours, about half the number of flights handled on a normal day. 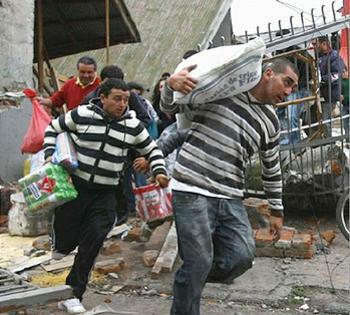 The earthquake struck just 60 miles (100 km) from Chile’s second-largest city, Concepcion, with of more than 200,000. 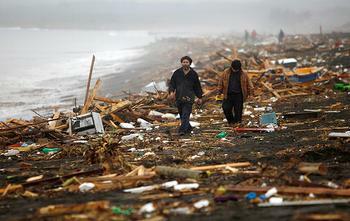 A tsunami triggered by the earthquake caused additional damage in southern coastal towns. Concepcion suffered severe damage. Electricity and communications infrastructure, major bridges and water mains have been reduced to rubble, as well as many hospitals. Communications are disrupted, and it is impossible to reach the affected area by road. President Bachelet has declared “zones of catastrophe” in the affected regions, including Bio-Bio, Maule, Araucania, Valparaiso and metropolitan Santiago. Following an initial assessment of needs and damage, the president said today that the government would accept some offers of international assistance – particularly aid in the form of field hospitals, temporary bridges and water-purification supplies, as well as damage-assessment experts and search and rescue workers. President Bachelet has obtained the cooperation of supermarket chains to deliver free food in the regions of Maule, Bio Bio and some sectors of the Araucania in places that the government arranges and identifies to the public. Water is being delivered by water tankers. In addition to restoring and maintaining order and controlling looters, the armed forces are assisting in the delivery and distribution of water and food and in the work of rubbish clearing. Health services have been disrupted, the World Health Organization reported today, dispatching a disaster management expert to Chile. The health network in the country’s north is operating normally, with hospitals continuing to function in the metropolitan area of Santiago, Chile’s capital. In the south, however, access to health services is proving to be a major challenge, with the collapse of six hospitals and severe damage to two others. The Chilean Air Force is setting up four field hospitals, each holding up to 60 patients, and there may be a need for additional facilities. Pan American Health Organization, a WHO regional division, says that there is a shortage of healthcare personnel, but that everyone in need of medical assistance is receiving it at this time. Adobe structures are believed to have been most affected and indigenous populations most at risk, PAHO staffers have found. 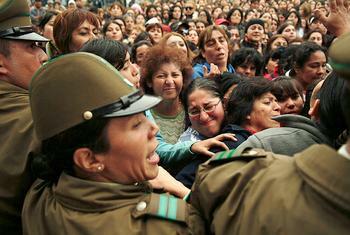 Chile’s Ministry of Education has suspended the start of the school year by one week. Classes had been scheduled to resume on today but will now begin on March 8. The Chilean Red Cross has been able to establish some contact with its branch offices in the affected zones, where volunteers are providing first aid. The head of the regional International Federation of Red Cross office, based in Buenos Aires, is on his way to Chile. He is expected to join Chilean Red Cross officials in an aerial assessment of the affected regions today. Governments across the world sent their condolences and offers of help to the Chilean people. Most are on standby, waiting for Chilean requests for help. The world has been focused on helping Haiti recover from an earthquake of 7.0 magnitude that shattered the island country and its capital city of Port-au-Prince on January 12. The two earthquakes were both severe, but there are many differences. The Chilean earthquake was many times more powerful than the Haiti quake but it occurred at a greater depth and farther away from major centers of population. Chile has been ranked as the 44th most developed country in the world in the UN’s Human Development Index while Haiti was ranked 149th. The measure covers life expectancy, education and standard of living. Chile has for many years enforced building codes that have made modern buildings more earthquake resistant and has placed great emphasis on emergency preparedness and response capacity. The country has a long history of seismic activity and the 1960 Valdivia earthquake was one of the largest ever recorded at magnitude 9.5 and killed more than 3,200 people.